Use KPI’s to increase player experience! KPIs (Key Performance Indicators) give you valuable information! 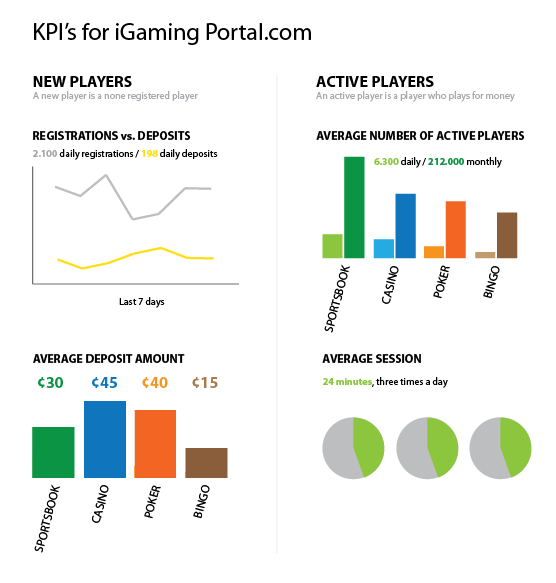 An example is the conversion rate from registered players to players who have do a first deposit. If the conversion rate is high then everything is fine, but if you have a really low conversion then you need to look deeper into the reason for why the numbers are so low. It can be anything from having a difficult user flow for register and deposit to not letting the player know why he should make a deposit. Guiding the player all the way through the process is really important and something that is very often overlooked. There are many KPIs that can inform you how your business is doing from a user experience point of view and using there KPI’s to find opportunities to increase the user experience is important. If you don’t use KPIs yet then it is time to start! Using KPIs will also be a great way to show how important the user experience is and how small modifications can increase the KPIs.